The Australian Packaging & Processing Machinery Association (APPMA) is pleased to announce that it will be heading to ProPak Asia 2018 on the 13-16th June, Bangkok, Thailand to host the Australian Pavilion in the Packaging Zone for the third consecutive year. The APPMA developed the pavilion as a way to assist Australian packaging and processing manufacturers and distributors to showcase their products and companies to the Asian market. INOX is a company engaged in successfully providing solutions for food and liquid processing. As liquid food process engineers, INOX specialise in the design and manufacture of complete systems and equipment for the heating, cooling, and processing of dairy products, juices, sauces, soups, stocks, preserves and jams, slurries, meat sauces, baby foods, fruit preps, specialised ingredients and any type of food products. Our goal is to provide our customers a basis for cost effective food production. Drop by, visit and support the all round nice people of Australian manufacturing active in the ASEAN marketplace. Following our recent successful trade show experience at PROPAK ASIA 2017 in Bangkok, Thailand, www.packagingnews.com.au magazine has published the following article in their July-August 2017 magazine. 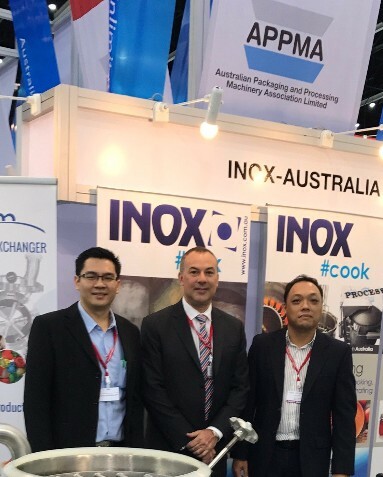 INOX was proud to have been associated with the Australian Pavillion and furthermore, would like to thank the organisers and partner association, APPMA – Australian Packaging and Processing Association for their enthusiasm and tireless efforts in making this a success for all Australian companies involved. We look forward to our involvement in PROPAK ASIA 2018 and further strengthening our relationship with our customers in the ASEAN region. Kelstream and INOX want to thank you for making our presence at the 2017 Propak Thailand a great success. We really enjoyed being at the exhibition and hope you did as well. We showed you the Instantiser high speed mixer and the Kelstream Scraped Surface Heat Exchanger. 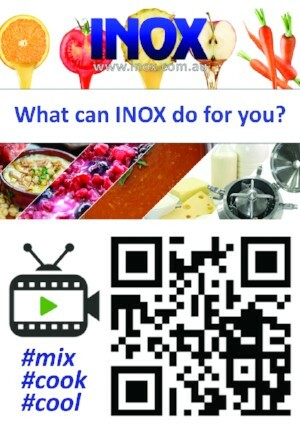 For more information of what INOX can mean for your product and process, please visit the INOX website: www.inox.com.au. To learn more about the heating and cooling capabilities of the Kelstream, please visit www.kelstream.com. We wish you the best and hope to hear from you soon. Otherwise we would like to thank you to visit us again next year. During the networking reception hosted by the APPMA, and sponsored by SMC Australia and New Zealand, at ProPak Asia 2017, His Excellency, Paul Robilliard, Australian Ambassador for Thailand highlighted that Australia is well known in Thailand as a source of commodities, agricultural and food products, automotive components – and as an education destination. Mr Robilliard added that there are many Australian companies active in Thailand; across many industries, including more recently in the services, digital and advanced manufacturing space. “It is one of the priorities of my team at the Australian Embassy to deepen, broaden and widen the trading relationship with Thailand. We will do this by helping companies work together, share their expertise and take advantage of opportunities to promote exports of high value goods and services – including, in niche areas such as this one, in the packaging and processing machinery industry. It makes perfect sense for our clever companies to work together in this industry.” Mr Robilliard said. Thailand is recognised as a manufacturing powerhouse in the region – and as a major exporter of food, industrial and electronic products. One of the obvious sectors is Thailand’s food and beverage industry. Positioning itself as the ‘Kitchen to the World’, Thailand remains the only net food exporter in Asia, and is one of the world’s top producers of food products such as rice, canned tuna, seafood, chicken, tropical fruits, snacks and confectionery; plus increasingly, packaged ready-to-eat foods. The domestically-grown food and beverage manufacturers of Thailand are expanding their presence globally – and much like their multinational competitors, are focussing on processing innovations to provide a greater range of convenient and healthier foods to consumers, as well as presenting these in the most contemporary packaging. Besides food and beverages, Thailand is also a significant manufacturer of household items, electrical goods, and pharmaceuticals; many of which require high standards of manufacturing and packaging. Thailand is active in attracting a range of other manufacturing and high-value industries to establish in the country; as it focusses on developing the Eastern Economic Corridor and on encouraging the growth of innovation. The increasing sophistication of consumer goods and industrial products is driving the need to deliver more modern and unique packaging solutions – and this in turn is driving the growth in demand for modern and sophisticated machinery and packaging equipment. The Australian Packaging & Processing Machinery Association (APPMA) is pleased to announce that it will be heading to ProPak Asia 2017 on the 14-17th June, Bangkok, Thailand to coordinate the Australian Pavilion for the second year. Exhibiting in the Australian Pavilion is HMPS, Inox – Australia, OFS, Woolcool Australia, the APPMA and the Australian Institute of Packaging (AIP). BBC Technologies will also be exhibiting in the same area and APPMA Member companies Fibre King, Heat and Control and tna will be exhibiting at the show on their own stands. The APPMA would like to extend an invitation for everyone to come and visit the Australian Pavilion in Hall 99 at ProPak Asia 2017. Come and meet the Australian Packaging & Processing Manufacturers and Distributors and see what new and innovative products and solutions they will be showcasing to suit the Asean Region. If you would like to arrange a meeting with us in the Australian Pavilion please email rob@inox.com.au today. The FDA has released a draft guidance on the control of Listeria monocytogenes for companies manufacturing, processing, packing or holding ready-to-eat (RTE) foods. The guidance is intended to help companies comply with the CGMP and PCHF requirements of 21 CFR part 117 with respect to measures that can significantly minimise or prevent the contamination of RTE food with L. monocytogenes whenever an RTE food is exposed to the environment prior to packaging and the packaged food does not receive a treatment or otherwise include a control measure (such as a formulation lethal to L. monocytogenes) that would significantly minimise L. monocytogenes. To reflect upon some of our achievements from our year that was. Please browse our 2016 annual yearbook that we share with our customers, staff, suppliers and friends throughout the world. 2016 was a successful year that we reflect upon with pride. We experienced many challenging projects and gained further understanding of our customers needs through close relationships with that contribute to further our knowledge of our customer’s needs and the ever changing requirements of the food processing industry. Particularly with special processing requirements, the need for food differentiation of our customer’s products and the need for specific well designed and quality manufactured systems and equipment manufacture is important and we do our best to develop our relationships with our customers to better understand their businesses. Thank you all, for being a part of our wonderful industry and we wish everyone an enjoyable, safe and prosperous 2017. You can now contact us anytime with our online real-time #chat function on our website. Our staff can answer your technical questions in real time. Try it!!! INOX is the Australian and Asian distributor for DOSANOVA innovative, reliable, high quality, low, medium and high pressure foam cleaning systems. The triple click nozzle arrangement is the smoothest and easiest to operate nozzle on the market. This video shows the operation of the valve and of the triple click nozzle that is available with various spray patterns. The housing is an engineering plastic that is robust and designed to withstand the harsh environment of any food processing facility. Contact INOX for the full range of DOSANOVA cleaning equipment.